Explore the Possibilities. Step into Your Own Natural Power. When life events knock you to your knees, you may need a little help to get back up. This program is created to be that helping hand. It is a system I created, compiled from my personal, business, mentoring and coaching experience, and includes approaches that helped me create a firm foundation from which to move forward in my own life. I call it 5 Petals of Power. There are tools and strategies at each stage that you can learn and adapt to your unique circumstance. Then you can put them into your own treasure chest to access at any time in the future. These tested techniques have helped many women put the pieces of their lives back together again in a new way. What I know for sure is life events will continue to happen. When you learn how to handle these events in ways that feel right, you will be prepared for anything life throws at you in the future. It’s how you can step into your power. 5 Petals of Power is designed to offer transformational experiences that turn you from upside down to right side up, while you reduce the overwhelm, regain your confidence and renew your spirit, so you can see clearly the possibilities your next chapter can reveal. I believe this system can help you to grow—from the inside out. It will give you permission to nurture yourself with kindness and teach you to thrive. Discover who you are today, so you can move forward from there. 5 Petals of Power can be accessed at any point, depending entirely upon where you are today. The Petals do not need to be experienced in any order, although some women find it helpful to explore the content in another petal to equip them better to move through the one they are on. You may like to start with a deep self-assessment as you’ll get in Find Your Footing. Or, if you have done some of that inner work and want to assess the areas of life that may include roadblocks and obstacles which require some focus to move through, you can start with Clear Your Path. If you want to jump right into bringing the dream into reality, you will want to Create Your Roadmap. If you’ve ever struggled to speak your mind clearly in life situations—expressing what you believe and want—you won’t want to skip Uncover Your Voice. And, in You Take Flight, the rubber meets the runway and all the hard work starts to pay off. This is where your passion meets your motivation. 5 Petals of Power is designed to deliver emotional and practical support through self-assessments, activities, coaching, mentoring and guidance. You’ll learn to elevate your mindset and expand your view of the world as you shift limiting beliefs, so they no longer hold you back. As you move through each petal, you’ll be introduced to strategies and techniques that help you adapt to changes. These are changes that naturally occur when you experience major life events that threaten your sense of harmony. It may be a divorce, loss of a loved one, career change, layoff, retirement or caring for aging parents or a spouse, to name just a few of life’s upside-down moments. You’ll be invited to create your own roadmap and implement inspired and passionate action plans that move you forward with ease and grace. The elements of this program are specifically designed so you can move gently yet purposefully through them. All the while, you’ll be making conscious choices that will ignite a fire within and set you on your unique path toward a joy-filled new life. Just imagine … in a relatively short time, you could make some dramatic changes. You will become more courageous and resilient. Start your next chapter more in control of your destiny and empowered to be your best. That’s what it means to step into your power. Regardless of whether you choose to work on one of the 5 Petals of Power or another, participate in a workshop or take a comprehensive deep-dive, you’ll have the opportunity to meet other like-minded women who are on a similar journey. Many clients talk about their fear of isolation after something major has shifted in their lives. The option to engage with other women allows you additional support, the potential for new accountability partners and to make new friends. The power of the group dynamic is amazing—and you get to harness that power and celebrate your achievements with people who understand you. You are not alone! You’re never alone. The support you want and the inspiration you need are here for you. I invite you to do something that your future self will thank you for. 5 Petals of Power is the first step to finding more clarity, perspective, and harmony in all areas of your life. I offer you an opportunity to explore each of the 5 Petals of Power in an online 90-minute workshop. Your first workshop is followed by a complimentary private follow-up call with me. We will focus on what you learned, adapt it to your unique situation and identify a plan you can put into action immediately. It’s a powerful way to get started. Then, if you desire to explore this area further, you’ll be invited to take a comprehensive deep-dive over a few weeks, so you can implement more strategies. I invite you to review the options below. 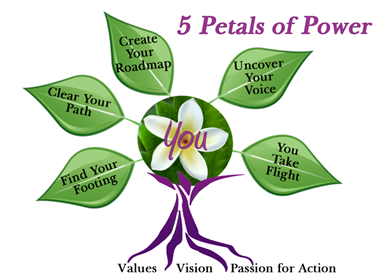 If one of the 5 Petals of Power speaks to you, schedule a personal, complimentary chat with me so I can help you figure out the best next inspired action to take. When you’re ready to be courageous and explore the possibilities the transitions in your life are creating, this program will help you move forward and thrive. Participate in an exploratory activity to discover how life has changed for you. In this personal self-assessment, you will understand what has happened, how you got here and where you are now so you can begin to create a firm foundation—your footing—from which you can move forward in confidence. Embrace the importance of having a support system and create your own unique Board of Directors or Band of Angels before you leave the workshop. See how you can benefit from this activity immediately. Week 1: What is your transition style? We all have one. You have likely gone through transitions before. Understanding how transitions happen and what your transition style has been in the past will help you learn what has worked for you in the past. Just as important: knowing what hasn’t worked. This will help to ensure a successful transition this time. We’ll explore that—deeply. Week 2-4: A series of activities and assessments to help you dig deeper into who you are now. When are you at your best? What is your lost dream? Who do you admire? What are your personal interests? Answering these questions will help you to know how you want to show up as you design a new life. Taking the “design” part seriously is your job during this phase. 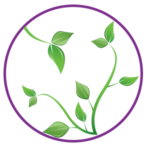 If you’re interested in knowing more about the Find Your Footing Workshop or Comprehensive Program, click the button below and schedule your Discovery Session. Obstacles and barriers—they can hold you back, cause you to take a detour or stop you in your tracks. We’ll begin to uncover what roadblocks you may be experiencing before we start an eye-opening self-assessment. Participate in completing Part One of a comprehensive Life Assessment exploring ten life areas, perhaps some for the first time. This will likely uncover where there are obstacles and barriers to finding a new balance in your life now that events have turned your world upside down. You will receive a workbook and journal to record your insights and impressions as you go through the workshop. Plus, you’ll be invited to continue the conversation with other women in our private 5 Petals of Power Facebook Group. You’ll make new friends and you may even find an accountability partner to help keep you on track as you continue your journey forward. Weeks 1 & 2: Complete Parts Two through Five of the self-assessment started in the workshop. You will come away with a deep understanding of where you are today and where you want to be. You will evaluate the level of energy and enthusiasm required to meet your goals, determine the resources you’ll need and begin to outline a workable plan to move each obstacle. Week 3: What zaps your energy and holds you hostage? Whatever you hold on to the hardest is what you need to let go of the most. We’ll explore the burdens that drain you. You’ll learn how you can release them, so you can get back your energy for more important things—like living your life by choice. Week 4: What else can hold you back? Beliefs—those things you’ve held on to that someone else taught you and may no longer be true for you today. Fears—much like beliefs, fears can hold you back from doing something you’ve always wanted to do, and now have an opportunity to do in your new life. But, you’re afraid. Perhaps you believe you can’t do it. Tackling both of these topics makes for a powerful way to step outside your comfort zone and into your power. If you’re interested in knowing more about the Clear Your Path Workshop or Comprehensive Program, click the button below and schedule your Discovery Session. In this workshop we will spend most of the time focused on what you want your new life to be. What is your vision? Where are You? Who is with you? What color are you wearing? The deeper the detail the better the road map. And to ensure that this is expressed by you in the most positive terms that honor who you really are and what you really want, we will explore the power of “I Am” and Core Values. This powerful workshop will leave you in awe of what is possible for you. You will be amazed. Weeks 1 & 2: Since the 90-minute workshop can only scratch the surface in these areas of “I Am” and Core Values, we’ll spend much more time on each. The Core Value Assessment is comprehensive and invites you to investigate more than 100 values and rank them from Essential to Not One of Mine. This activity firmly defines the values you choose to live by in your new life. How often have you discovered that you’ve been living by someone else’s rules, compromising your values? Never again. This assessment will make sure of that. You’ll have a powerful checkpoint for every decision you face going forward. I promise. Weeks 3 & 4: Working on your roadmap is the quintessential activity of this program. So, ensuring your vision is what you want right now is critical. Details are important. Timing is important. Breaking things down into small steps, so you don’t get overwhelmed, is important. Priorities are important. We’ll focus on all those elements of your roadmap so you know what you need to do first, second and third. If you’re interested in knowing more about the Create Your Roadmap Workshop or Comprehensive Program, click the button below and schedule your Discovery Session. What are the voices inside your head saying as you think about your vision of the future? Are they saying positive things? Or negative things? In this workshop, we’ll discover how to suspend disbelief, the power of self-talk (when done to support you rather than sabotage you), and the golden thread in creating affirmative expressions of your new found belief system and values. This is pure magic, my friends, and the wind beneath the wings of your roadmap. Weeks 1 & 2: What makes you tick? What makes you tick differently than your neighbor, your brother or your spouse? Explore the elements of personality and how understanding why you behave the way you do helps you to speak up authentically and with confidence. Weeks 3 & 4: Self-talk is a deep subject. What we cover in the workshop is just the tip of the iceberg. How you talk to yourself and the thoughts you think has an enormous influence of on what you do. Harness the power of your self-talk, making sure it works in your favor. You will come away with tools and strategies to super-charge your journey. This is pure magic, my friends, and the wind beneath the wings of your roadmap. If you’re interested in knowing more about the Uncover Your Voice Workshop or Comprehensive Program, click the button below and schedule your Discovery Session. What good is having a rock-solid foundation, an unobstructed path, your roadmap, a crystal-clear vision of where you want to go, great intentions and affirming thoughts in your head, if you don’t have a strategy and a plan to make it happen? In this workshop, you’ll learn some powerful techniques and tactics to create your plan of action to make the dream happen. Some might say this is where the rubber meets the road. I say this is where you spread your incredible wings and take flight. Weeks 1 & 2: The workshop can only give you a taste of the pudding in 90 minutes. The deeper dive will teach you the benefits of evaluation, unique strategies for prioritization and decision making, and 25 different ways to research your options as you explore the opportunities of your new life. This one is jammed with great tools that you can use for a lifetime of transitions. Your treasure chest will overflow. Weeks 3 & 4: More tools for your treasure chest as we wrap up this deep dive. I’ve put action planning on steroids for you. With 30+ years in Corporate America, my organizational and time management expertise has come into play. I share tools for strategic planning, goal setting, a process for making life changes, assessing what works/what doesn’t, tracking achievements, follow-through and accountability, plus a checklist for success. All while making it feel good to you—because if it doesn’t feel good, why do it at all? If you’re interested in knowing more about the You Take Flight Workshop or Comprehensive Program, click the button below and schedule your Discovery Session. Each workshop and private session has a workbook to download, so you can capture thoughts and insights. They will be conducted via video conference and recorded for future review. Your participation in the exclusive, private Facebook group for 5 Petals of Power workshop attendees and private session clients is optional, and included in your participation fee. “María’s personal experience and coaching expertise give her great insight on how to overcome the feelings of abandonment, overwhelm or anger that can come with loss. She will help you with self-reflection and to seek answers, so you can be courageous and resilient.